Dominator channeling Troy Fernandez. Dig it! Tab of solos here. Schoenhut, makers of toy pianos, is marketing knock-off copies of Dale Webb's wonderful Flea Ukulele. Made in China (real Fleas are made by the Magic Fluke Company in the USA), Schoenhut's copies sell for around $30 at various online retailers. Compare that to the starting price for real Fleas at $180 (and most are much more), and it begins to spell real trouble for Dale. 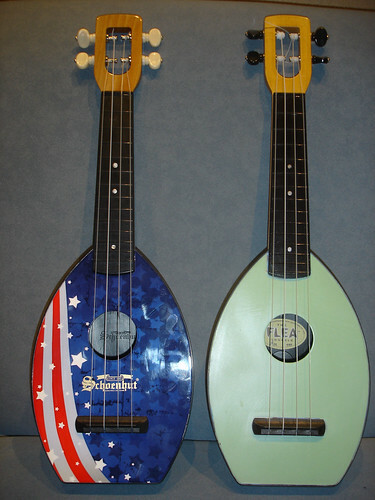 Ukisociety Jones has a comparison posted on Ukulele Underground, along with a sound comparison here. The sound of the real Flea is superior, but it'll be hard to convince the average consumer that it's worth an additional $140.